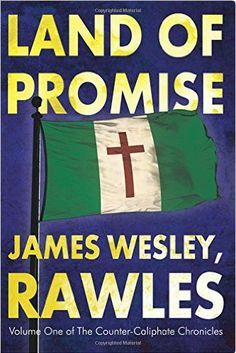 Amazing author James Wesley Rawles, founder of SurvivalBlog, has just released another amazing book in a string of amazing blockbusters over the last few years. This guy never fails to provide readers with gripping, edge-of-your-seat dystopian thrillers. His newest book is entitled Land of Promise, and today is his "book bomb" release date. Land of Promise is synopsized as "speculative fiction that posits the establishment of a Christian nation of refuge, in response to the establishment of a global Islamic Caliphate in the near future. Launched by a pair of free-thinking venture capitalists and an Israeli art dealer, the fictional Ilemi Republic is carved out of a disputed border region between Kenya and South Sudan, with the consent of the governments of these two neighboring nations. The fledgling Ilemi Republic is a nation of firsts in modern history: The first nation as a dedicated place of refuge for Christians and Messianic Jews; The first nation with absolutely no taxes or levies of any kind; The first nation with no licenses or permits; The first nation with minimalist government; The first nation to reject fiat currency and establish a tri-metallic currency (gold, silver, and platinum); The first nation to have a self-policing citizenry with a citizen's militia--and hence no standing army and no police force; The first nation with a near absolute right to keep and bear arms, where only weapons of mass destruction are restricted from private ownership; and the first nation without a parliament or congress, where all decisions are made by public referendum." Folks, if you enjoy dystopian literature, you won't be disappointed in Land of Promise. ...but it's a pleasant fantasy and a story I'm eager to read. tell me what you think. am asking people's opinions. some say europeans will rise up and counterattack. others say what with? they have been disarmed. I really enjoyed this book. Thanks for bringing it to my attention! It was very technical, but the story moved well. Can't wait for the sequel! I enjoyed the book. I've been thinking about this idea but in a virtual setting.